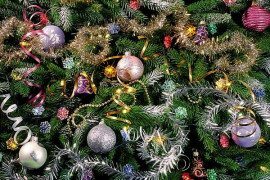 Christmas is all about spending time with family and friends, decorating the house beautifully, and enjoying loads of fun and frolic. While many of us deck the entryway, living and even the dining room with shiny Christmas ornaments and sparkling lighting, the bedroom seems to go unnoticed and under the festive radar. Change this dull and boring trend this holiday season by decorating your cozy bedroom appropriately as the big day comes knocking on the door. Add to the magical aura all around you and wake up feeling a lot more ‘Christmassy’ by transforming the ambiance of your bedroom with dazzling holiday decorations. 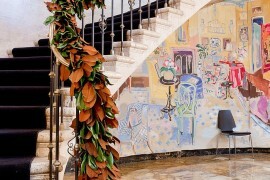 Red and green look as appealing in a modern context as they do in traditional settings. Much as in the case of the red and green dining room, shaping a modern bedroom in these two hues is all about using them in moderation. This becomes all the more simple during the festive season, as some lovely garlands in green and Christmas ornaments in red easily get the job done. The bedroom here uses red more extensively with drapes, a painted bed frame and a ravishing red lamp shade. We absolutely love the look of the contemporary bedroom, as there is not a detail that you need to change even beyond the holiday season! 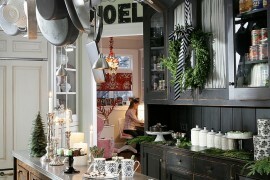 This urbane space looks both festive and fashionable and will serve you well all year long. 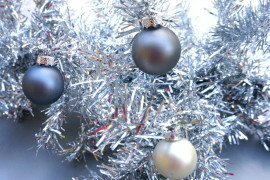 Sure, if you want to add some extra Christmassy flavor, then bring in some unique hand-blown Christmas ornaments and mistletoe to spice up the trendy bedroom. 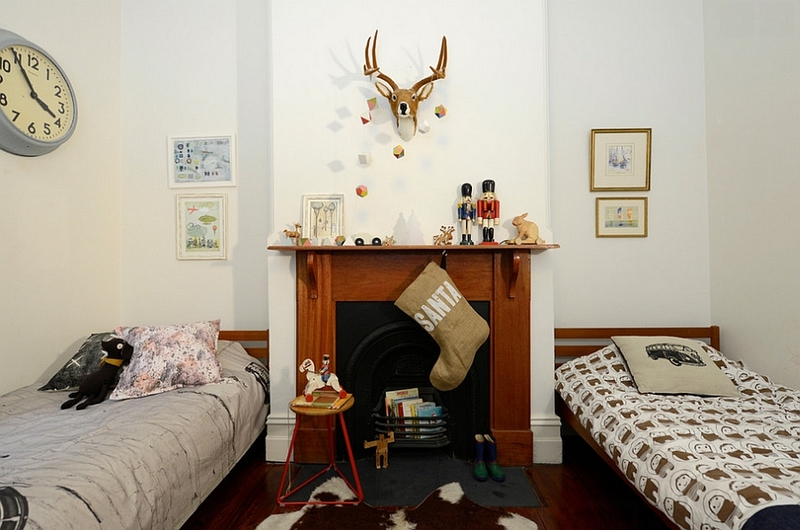 This kids’ bedroom takes an entirely different approach to holiday decorating by opting to keep the usual red, green and gold out of the picture. 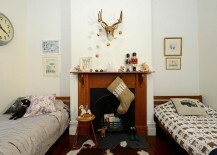 A Christmas stocking at the fireplace and a few simple figurines are used to usher in a restrained, understated festive theme. An approach that works well for those who wish to shun pomp! 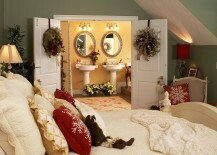 There is something about the holidays and the rustic or woodsy cabin look that seems like a match made in heaven! This bedroom takes a more rustic approach to decoration, and the wooden accent wall in the backdrop enhances the warm, inviting vibe of the space. 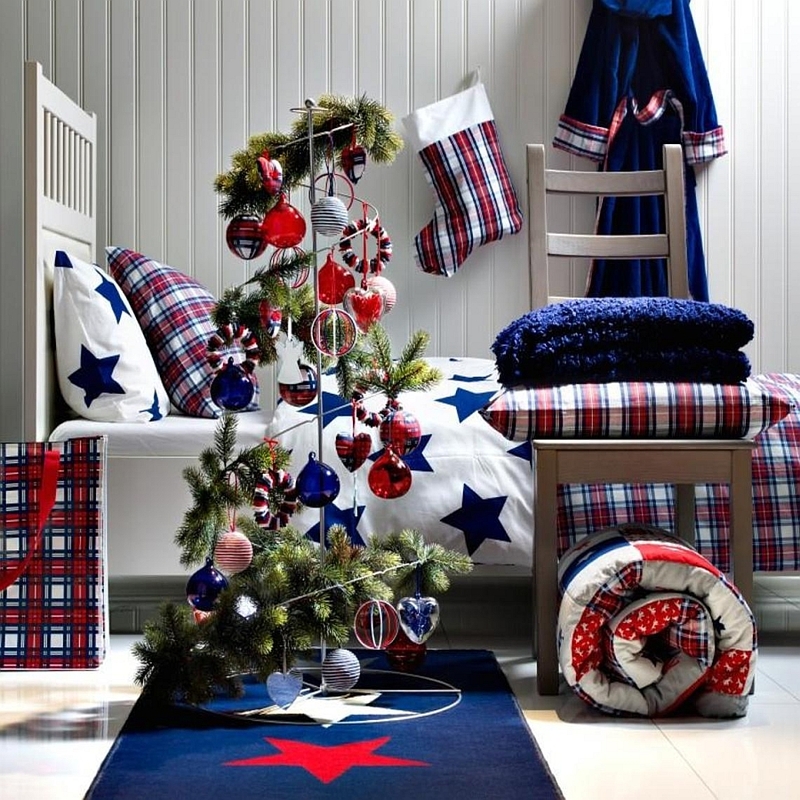 Some dried branches, a few shiny stars and small wreaths bring in the holiday cheer in a graceful, snug manner. 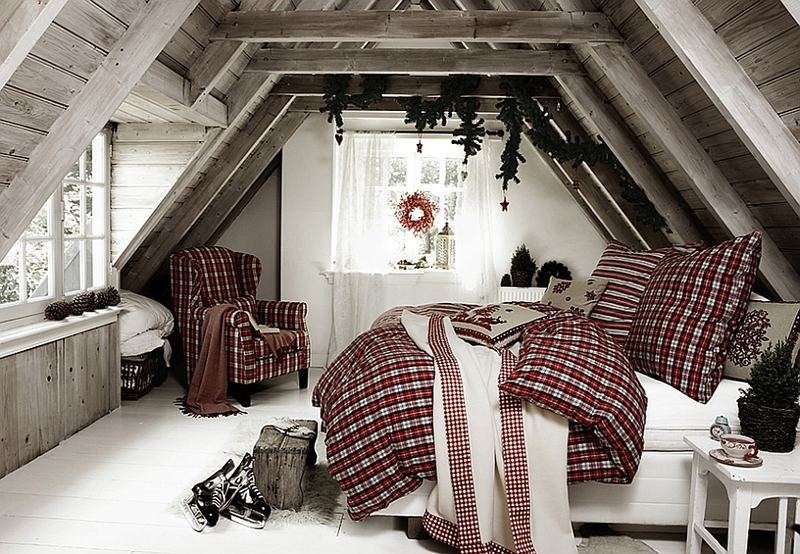 Transforming an attic bedroom with Christmas decorations creates a space that is even more cozy and festive! Exposed wooden beams, the use of a checkered red and white pattern for the bedding and the chair in the corner, along with some natural greenery gives this room a magical, intimate vibe. Just imagine waking up in this space on Christmas morning, looking at the snow-covered slopes outside and then tucking back in with a warm cup of your hot chocolate or coffee! 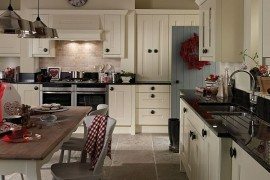 Are you in love with Scandinavian design? 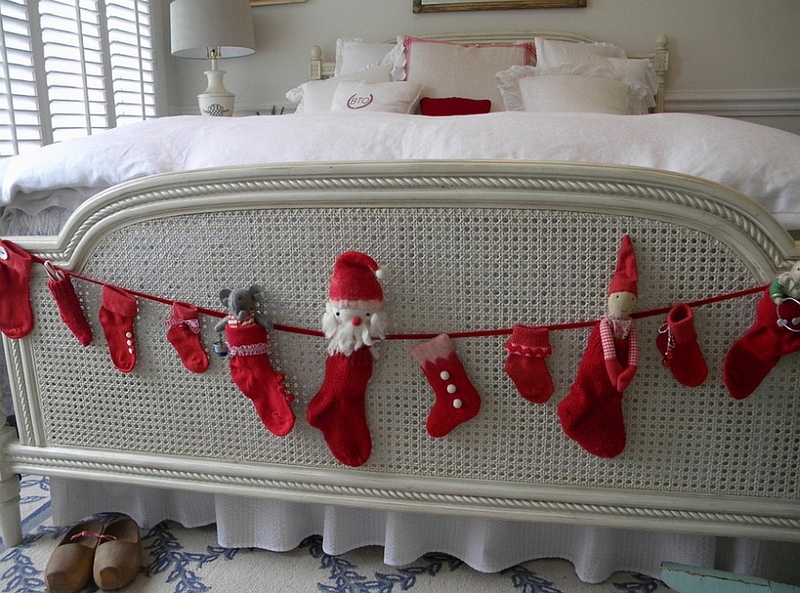 Why not deck out the bedroom with Christmas ornaments that echo this style? Minimalism is an inherent part of Scandinavian styles, so avoid bold colors, intricate patterns and ornate decorations as much as possible. 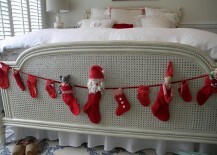 A few baubles in shiny silver, an illuminated star on the nightstand and gentle pops of red do the trick here. So you are a traditionalist at heart and still want Christmas decorations that remind you of your childhood trip to your grandma’s house during the holidays. Add warm yellows along with plenty of green and red to achieve this nostalgic vibe in the bedroom. 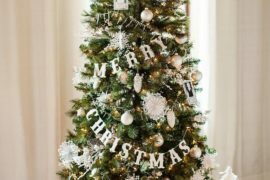 Traditional wreaths, tinsel, snowflake patterns and shiny ornaments decorating the windows are a great way to take it to the next level. Here is another idea that will take very little of your time, and considering that we are just a few days away from Christmas, it is not a bad option at all. This homeowner embraces her Swedish roots with fun decorations that add festive cheer without going overboard. It also tells you that you need not completely alter the appeal and the color scheme of the bedroom for the next two weeks to usher in a hint of the season’s joy. Finally, we have the good ol’ string lights that seem to have the ability to bring a Christmassy look to pretty much any space they adorn. 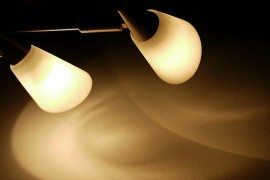 Just make sure that you are careful with the wiring while mimicking bedroom decorations such as this and the sparkling delights will take care of the rest. Another great last-minute idea indeed!